Q: What are the store hours at Hyderhangout? If we have a class going we are also open for shopping Click here to see calendar for other hours. WE WELCOME CALLS TO OPEN OTHER HOURS BY APPOINTMENT! 423-715-2908. VISIT US ON YOUR TRIP OR COME BY TO SHOP AFTER REGULAR HOURS, FOR CONSULTATION, OR SPECIAL CLASSES. Q: What do you mean by custom cutting by Hyderhangout? A: Custom cutting is fabric cut into shapes and sizes according to the customer preference and order. Cutting can be done by using scissors, rotary cutting, or a system that uses dies to cut precision shapes. 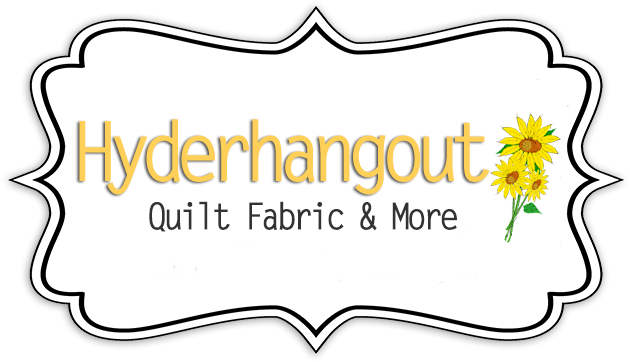 At Hyderhangout, we own an Accuquilt system. We have dies already in stock for some quilt squares, shapes, and strips. We have pre cut quilt kits, shape packs, and fabric bundles in stock. Some are not on our website yet, or we can get a kit together for you. Ask for a custom cutting charge quote any time. If we do not have a die to cut the shape you want in stock, and the pre ordered quantity is enough, we will order an Accuquilt die to do the job. Otherwise we will do precision rotary cutting. To see the dies available with our system, you can visit Accucut dies or Accuquilt site. See something you want? Contact us and we will do our best to fill your order. We are also a dealer for Accuquilt Go. This is a system you can purchase yourself and cut your own fabric. We will meet or beat ANY advertised price. Contact us on how to order. Q: What kind of fabric do you sell and where do you get it? A: We get our fabric from a variety of places. We have fabric and notions ranging from upholstery to evening dress and everything in between. Not all of our fabric is listed on our online store. We buy some from wholesalers. We try to special order anything you find on their web sites and add it to our store inventory at customer request. See something you like there, contact us and we will do our best to get it for you ASAP. 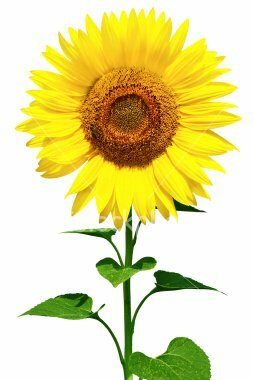 For items we can order visit some of our suppliers. Go to Choice Fabrics, Troy Corporation, Quilting Treasures, Cranston VIP Collection for some of the fabric collections we carry all the time and can send out quickest. Contact us for ordering availability and delivery time. We go to auctions and estate sales and get boxes and bags of fabric. we just might have something in our inventory that you would like. We don't ever have all our fabric listed as we get new products quite often. Let us know what you are looking for and we will do our best to get it. We also buy bags of scraps and leftovers from crafters, sewers and quilters. You all have things you will never use. Don't throw it away, don't give it to the dog, don't stuff it in the attic to rot. Contact us and let us know what you have. We just might be able to buy it. We give a decent wholesale price for whatever we buy. We also get fabric and other sewing and craft items from stores and factories that are having clearance or going out of business sales. If you know of a store going out of business, let us know. You may not want to buy their whole store or bolts and bolts of fabric, but we just might. We are always scouting to get more pieces of a greater variety for our craft and quilt customers. Q: What is a reproduction fabric vs. a vintage fabric? A: A reproduction fabric is a newly made fabric printed to look like an old fabric. A vintage fabric is a fabric of an older age that is the actual fabric from that time; manufactured decades ago. We have heard a great difference of opinion of what a vintage fabric is as far as age goes. Some people say it has to be fifty years old. Others say it has to be old and made in a certain decade. 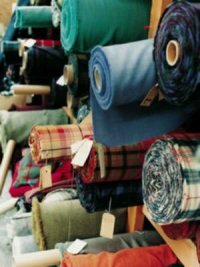 It used to be the fabrics from the 1960's were not considered vintage, but recently we have seen many use "vintage" 1960's fabrics in their vintage quilts. If you are buying vintage fabrics from anyone, ask about the age and how they have documented it. Q: What is calico fabric? A: In the first use of the term calico was strictly a cotton imported from East India from a Company called Calicut. As time went on the term was used for any cotton cloth with closely printed bright colors. Usually in a floral print. The print is in small scale so it was ideal for pieces cut into small patches for quilts. Imitation calico, reproduction calico and genuine calico printed on the more than 100 year old plates are available for sale today. Q: What is fussy cutting? A: It is precision cutting of fabric to cut out a specific area of the fabric to be used in the quilt. When you cut out a particular area of the fabric or a picture out of the middle of the fabric, you are fussy cutting. As the name implies, it is fussy and takes time. You can cut out specific motifs or specific images to be used in your quilt. 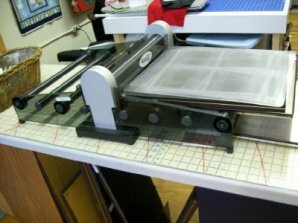 We do not currently have any fussy cut dies for our Accuquilt system, but they are available for special order. Q: What is a patch? A: An individual piece of fabric cut into a shape to be joined together with other patches to make a quilt block. It is also sometimes called a quilt piece. It can be cut freehand, using templates, rotary cut with rulers, and die cut. It is the basic building block for all quilts. It can be small or large. When one sew patches together, they become quilt blocks, then the blocks are joined to make a quilt top. A: This is the fabric that joins together and separates blocks in a quilt. These can be used as part of the design, to make quilts larger, or to make blocks of various sizes fit together better. Most of our precut quilt kits do not have the included sashing cut to length. We, as human quilters, each have slightly different ways of joining pieces. All of us vary slightly in how large our quarter inch seam allowances really are. When the pieces are joined to form a quilt block the ending measure is not always exact. Your 12" finished block may be slightly larger or smaller than mine. We leave sashing material included in the precut quilts in long pieces and let you cut it to length yourself. After the blocks are done and ready to have the length applied, you can measure your blocks and cut the sashing to length then. Q: What is a selvage edge? A: This is the edge of the fabric that finished so that it will not ravel. It is a stiffer, thicker area of the fabric along the edge that measures approximately. 1/3" to ½" wide. It will shrink differently than the rest of the fabric. Therefore, this edge is typically cut off and not sewn into a quilt.. Some fabrics have designer and pattern info on one selvage edge. We do know of a new quilt designer, that is using nothing but selvage edges to make her quilts. I also have one customer that is scrounging all the selvage edges she can get to make a quilt. We have seen her progress and it is beautiful so far. See, we quilters are a thrifty bunch. Q: What does the abbreviation WOF mean? A: It stands for width of fabric. Most cotton quilting fabric measures from 42" to 44" in width. Some patterns and instructions use this acronym in their instructions. If you are told in a pattern instruction to cut a strip so many inches wide by the WOF, it means that you can fold the selvage edges together and cut across the fabric from selvage to selvage. Q: What is a fat quarter? A: This is a cut of fabric that is cut to give quilters a more useful area of fabric. It has the same surface area of a piece of fabric cut 9" by the WOF. Fat quarters are said to measure 18" x 21". (Some are said to measure 18" x 22". The difference in the length of a fat quarter has to do with the difference in the width of the original fabric selvage to selvage edge.) In all our listings we sell our fat quarters are at least 18" x 21", but many end up being larger than that. We have some fabrics that just do not measure 44" in width from the factory or it is Estate fabric which is smaller to begin with. Q: What is a fat eighth? A: A fat eighth is a fat quarter that is cut in half. There are two ways to cut a fat quarter in half. You end up with a fat eighth that is either 10.5" x 18" or 9" x 21". 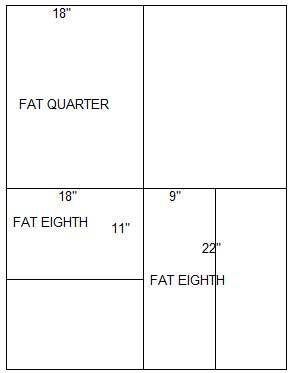 In our stores, our listings for fat eighths will be 9" x 21" unless there is the size difference listed in the description. Q: What is a sweet sixteen or a fat sixteenth? A: This is cut along the same lines as the items above. This is a fat eight cut in half. Sweet sixteens most commonly measure 4 ½" x 22". Rarely they will be cut to measure 9" x 11". One Yard Cut THE WIDTH OF FABRIC BY ONE YARD (36"). This drawing shows a piece of fabric that is 44 usable inches wide. Remember if the fabric is wider or more narrow, the sizes of the pieces cut will be slightly different. Q: What is a charm pack? A: Originally the term charm pack was used for just a pack of 5" squares that were all different. It has been expanded in its use today to include any of the squares of that size in packs. In our stores, we will state if the pieces are all different or maybe have a quantity of some of each color. We will also state the size of the squares in that pack. We have in stock packs of squares from 2" up to 6 1/2" in size. We also have triangle packs available. There are manufacturer specific names for their 5 inch packs, so if in doubt ask us. We love to help. Q: What is a jelly roll? A: A jelly roll is a package of fabric that contains strips of fabric cut by the WOF. Moda fabrics has a standard of a jelly roll containing 40 each -- 2 ½" x WOF" strips. Some other suppliers have their jelly rolls with different quantities. In our listings in our stores, we will have noted what the qty. of strips there is. We have what we call jelly roll shorts. These rolls have strips that are not the full width of the fabric and come in sizes 2 1/2" wide by length of 22" or less. Jelly rolls are also known as strip packs, sugary strips, happy halves, roll packs, and other manufacturer specific names. Q: What is a layer cake? A: This is a term that Moda fabrics has started using. It is a pack of 10" x 10" squares. We do not know if they have a set quantity, but usually it will be a square cut from one of each fabric in a collection. We can see that soon quilters will be calling all packs of 10" x 10" squares layer cakes. We have some limited quantity of packs cut from the collections we have in our shop. If you want a particular item in this size please contact us. Q: What is a turnover? 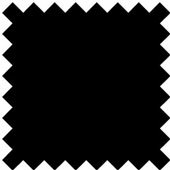 A: This is again an item Moda fabrics has started using for a particular cut of fabric. Turnovers are packs of 6" cut half-square triangles. Q: What is a Sweet Roll? A: This is another term that Moda Fabrics has started to use. Sweet Rolls are strips 40 -- 1 ½" x 45" strips. In our stores we do not use this term. We use the term Jelly roll for all of our strip sets an specify the width of the items. We will clarify in the listing what the width of the fabric strips are. Other sizes that exist in the Quilting World may be available at Hyderhangout. I you are looking for something else listed on a pattern you have contact us and we may be able to cut a pack for you. Owned by an avid quilter and craft enthusiast to help crafters, quilters and sewing addicts find small quantity quilt and craft fabrics at bargain prices. Also, we have quilt and craft books, quilting and dressmaker patterns, notions of all kinds, and craft supplies. Many products discounted below MSRP. 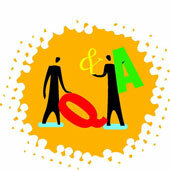 FOR ANY OTHER QUESTIONS CONTACT US AT info@hyderhangout.com. We love the questions and would love to hear from you.